So it seems, as far as my eyes are concerned, that I'm out of the woods. I had my second round of Lasik surgery two days ago. I was talking to Sunny the night before I went under the laser for the second time. I told her how the first round back in January worked well on the left eye but not so much on the right. I can read and use the computer, everything close up is great but long distances and low light are hard. So I haven't liked driving at night and my depth perception is janky. Oh, and grocery stores. Grocery stores are a mess. "It is so hard not to knock over the pyramid of cereal boxes," I said. All the different colors and signs and displays confuse me and I walk around squinting and blinking, trying to tell what's what. According to my doctor, my right eye was regressing. My right eye had been trying to grow its cornea back to its former curvature, the curvature that made it nearly legally blind in the first place. WHAT A JERK. "But it's okay," I said to Sunny, cautiously preparing myself for failure, "Even if my right eye doesn't get totally fixed, I'm still much better off than I was before. I could wake up without glasses in the woods now and get out without being eaten by a bear!" Because this is a very likely situation. "Well, with your left eye," she clarified. "You're right. My right eye would lead me straight into the den but my left eye would get me out." Surgery #1 was a procedure called IntraLase and it was bladeless and all-laser. It was very early in the morning so I was deliriously tired AND they gave me Valium so I was what we would call relaxed. I was nodding off in the cushy little pre-op waiting room when the nurse put numbing drops in my eyes and led me into surgery. They taped my eyelids back and propped my eye open with an eye speculum. It was at this point, I swear to God, that a song came on the radio, Blinded By The Light by Manfred Mann's Earth Band. Are you serious? I didn't know what that means but through the haze, I knew that it was deeply funny. They told me to keep still and to keep watching the orange dot, a pinhole of a light from the laser machine. I had no problem whatsoever doing this, I was chill. Even when the laser started making a zapping noise and I smelled something burning - my EYE - I really didn't care. Evidently I respond well to Valium. This time around I expected the same. In fact, I thought it would be better because I knew more and had already been through it. I knew I would be terrified of getting shower water in my eyes in the first few days after surgery so I took extra care to do my hair on the day of in hopes that it would look cute if I didn't wash it for a day or two. Kind of embarrassing to admit but true. "Your hair looks really good today," Matthew said in the waiting room. "Oh? Thanks," I tried to be nonchalant. They called me back to the exam rooms to run a few final tests. At my appointment the previous week, they couldn't get my eye to dilate so this time they gave me Valium (sweet!) to relax and try the test again. They lowered the lights and left me for ten minutes to think happy relaxing thoughts. For the record, Valium is fast-acting; I was GOOD after about 30 seconds. They did the test but still my pupil did not want to dilate. "Okay, wiggle your left pinkie toe," the nurse said, "That helps the pupil." I started trying to wiggle my pinkie but it suddenly seemed really difficult and then the nurse said, "I know it sounds gay but just wiggle it for me." Wow. Did she just say that? My pupil suddenly dilates. I expect to go into surgery at this point but they send me back to the waiting room. I plunk down next to Matthew and tell him I'm on Valium. I really want to smile. I want to smile so much that I become self-conscious and try very hard not to smile because I know there is nothing to smile about. I am acutely aware that my body language has changed from when I was last in the waiting room: instead of primly reading a magazine, I am slouched in the chair, legs stretched out, arms folded over my stomach, trying desperately not to smile. Matthew can tell that I'm self-conscious about being drugged so he decides to run an errand instead of laughing at me. After he leaves I watch FOX news for about three minutes until I'm getting so pissed that I think it's going to make the Valium wear off and I switch to the History channel. Finally they call me back to surgery. I spend a few minutes in the comfy pre-op chairs where the nurse briefs me and puts the attractive shower cap thing on my head and then? THEN? A song comes on the radio, a song by Foreigner called Double Vision. Are you KIDDING? I can't believe this! Is this radio station rigged? Something Sunny had said to me on the phone was, "I hope you don't get a wandering eye from this surgery." This was purely hype on her part, an attempt to wind me up and get me going. She even said something about me becoming walleyed. "Well," I responded, "If I do get walleyed, it will sure come in handy on the wedding day when I have to talk to so many people. I can kill a lot of birds with one stone, talking to my mom with my left eye and Aunt Joann with my right." They put numbing drops in my eyes but instead of laying beneath the laser machine, I have to first sit straight up in another chair. "We're going to loosen the flap first and then use the laser," my doctor says. FYI: the flap is the circular patch that they cut out of my eye and reattached in January. "Okay..." I say. My doctor sits across from me with a sharp instrument in his hand. It's a cross between a scalpel and the pick that dentists use to get at the plaque between your teeth. All I know is that he's holding my eyelid open and aiming the scalpel pick thing at me. I see it getting closer and closer and then I CAN FEEL IT. It's not horrible but it's enough to make my face start to crumple and my whole body tense. The surgical assistant who I keep thinking of as an orderly even though he's not an orderly notices and says, "You can feel that?" "Yes," I gasp, wanting to cry because suddenly I feel like a big fat baby. They put more drops in and my eye is totally numb but I am now trying to concentrate on breathing and not panicking. My doctor cuts the circular flap in my eye and leads me to the laser table. I feel nothing but I'm freaked so it doesn't matter. The zapping and burning smell starts and the nurse is counting backwards, I hear her say "Seventeen, sixteen, fifteen..." and I try to blink and I move enough that the laser automatically stops. It resumes and I stay still but I'm telling myself the whole time, "Breathe, breathe, breathe," and reminding myself that I have a mouth and that I should breathe through it. It's over quickly. My doctor, the orderly, the nurse, the receptionist at the front desk, everyone is so nice. I am prepared to go home and face the uncomfortable sand-in-my-eyes feeling that I had the first time around and I cajole the nurse into giving me the special anesthetic drops that they won't name, the drops that they say only to use in case of severe pain and to throw away after 24 hours. They give them out in an unmarked bottle and I am convinced they are narcotics. I am fixated on the mystery surrounding the drops since no one says what they are but I don't even need them this time. The pain is minimal. I keep my eyes closed as ordered and immediately fall asleep for five hours. My greatest fear has been clawing at my eyes in my sleep. After Lasik you aren't allowed to rub your eyes and, after my first surgery, I didn't know how to keep myself from rubbing and tearing the flap open in my sleep so I slept with a bandanna over my face. This time they gave me safety goggles, clear plastic eye masks not unlike the ones you wore in tenth grade chemistry class. 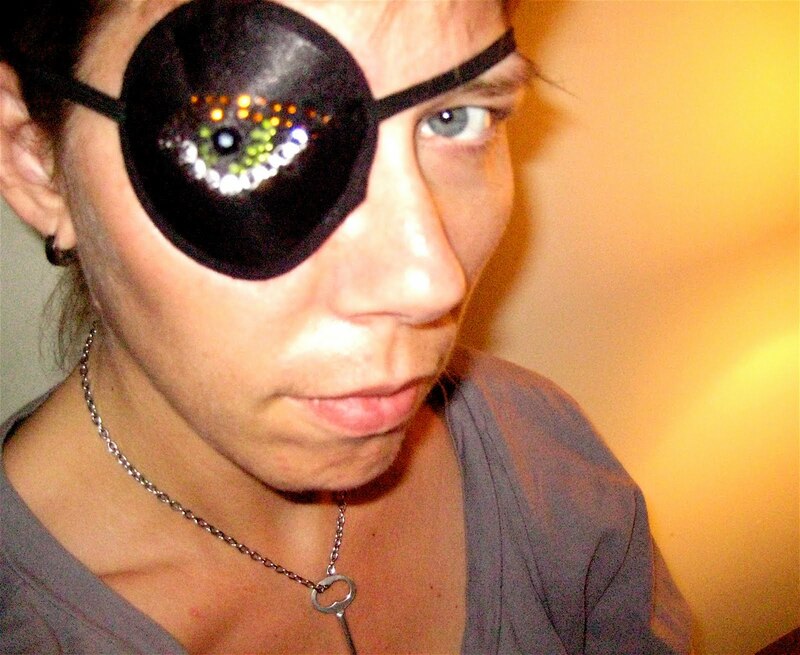 I, however, remembered the eye patch that Rose made for me last summer when my eyes had so many problems with infections and irritations, the reason I decided to get Lasik in the first place. Rose rhinestoned a somewhat creepy and too-large eye onto a patch for me and this week I'm wearing it to bed every single night. When I wake up, I can see. That eyepatch is AWESOME. And hooray that you can finally see out of your renegade right eye. But you have sufficiently scared me out of ever getting Lasik. Did I ever tell you that when I go to the dentist (of whom I am deathly afraid), I need not one, but TWO Valium to get me to even open my mouth. Yeah, I'm mature like that. Ditto for me--Roncky, you've reinforced my fear of Lasik.